Bahrain calling Freedom and Democracy ! Political figures were arrested in addition to at least 2000 detainees from citizens,Arrested at least 100 women,Arrest medical staff of doctors, paramedics and nurses,Arrests of journalists,writers, poets, students, lawyers, jurists, merchants,businessmen, human rights advocates, etc. People were laid off from jobs arbitrarily,schools and universities raid Students dismissed from ,Destruction of property of people,Infringement on the role of worship,Infringement on the people at checkpoints. In short it is a collective punishment to all those involved in the protests,What is the reason of all this repression and brutality?,Because of we need the election of the Government by the people As happened in Tunisia and Egypt. All this is happening with the blessing of the Government of the United States and Britain, why give them cover to do all this?, Because the world is dirty America's silent because of the presence of the Fifth Fleet of the U.S. base in this country, in addition to oil and gas it is more important in their view of humanity. 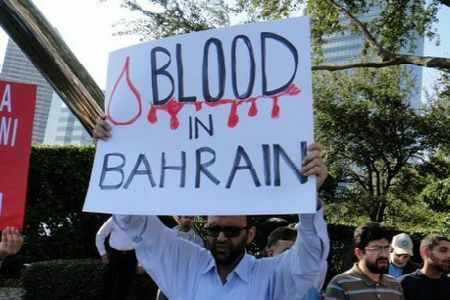 UN Monitors the Deteriorating Humanitarian Situation in Bahrain.